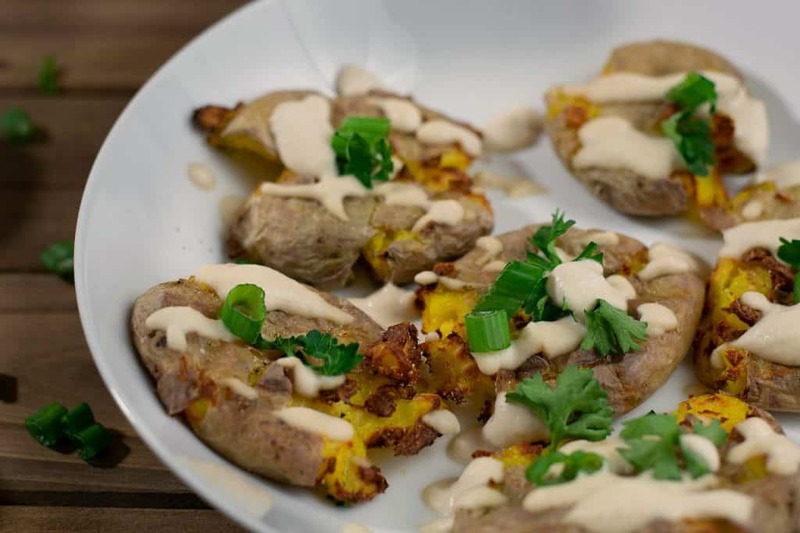 I’m still not sure if I want this recipe to focus on the smashed potatoes, which for me were a totally new way of eating my favorite starch, or if I just want to focus on the Vegan Garlic Aioli, because I was just so blown away by how good it is. Let’s talk a little about both. 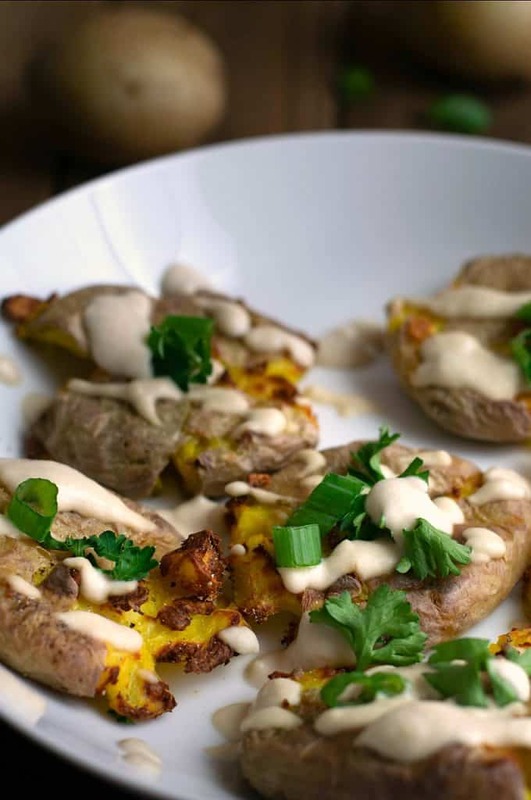 The smashed potatoes are simple. Boil up some baby potatoes in your favorite pot. Sure, Instant Pots are great and all, but you really don’t need one for this. Just plop some taters down in a pot with water and boil for about 25 minutes or until fork tender. Then, we drain them and then smash them. I’m not talking about mashed potatoes here, but smashed. In other words, find something flat and smash them down a little. That’s it. Then you can either put them in an oven, a broiler, or an air fryer until they get crispy on the outside. Crispy on the outside – creamy on the inside! Add a little seasoning and maybe some freshly chopped green onions or parsley…..yum. But let’s not forget the Aioli. Aioli is a sauce that is traditionally made with oil so I knew I’d have to get creative to keep this as low-fat as I could. I was going to use cashews – as many vegan cream sauces do – but like I said, I was concerned about the fat. Then, I thought, “Ok, I’ll use white beans”. But really didn’t want a BEANY flavored sauce either. Tofu? Lots of people do not like tofu or are allergic to soy. What about Cauliflower? Again, there are lots of people who won’t even look at it, let alone taste it. So I went back to the cashew idea because I knew the flavor would be pretty neutral and I really wanted the garlic to stand out as the star of the show. But then I couldn’t get it creamy enough, even with my Vitamix. And NOBODY wants a creamy aioli with chunks of cashews floating around. So I added the beans anyway. And oh my word – what a difference. This sauce is SO creamy now you’d swear it was mayonnaise, and without any of that beany flavor I was afraid of. An additional benefit of adding the beans is now I’ve essentially reduced the calorie density of my cashew sauce – a lot. Now don’t think you can just go eat the entire bowl, because that would STILL be a LOT of calories. But as a dip or drizzle sauce? Especially for these smashed potatoes? I can honestly see this sauce being used in a lot of ways. As a dip for my homemade fat-free Potato Chips, or maybe as the mayonnaise in my Vegan Tuna Salad.… all kinds of things. If you use it for something besides these potatoes, please leave a comment below and let me know, and I’ll share it in my Facebook Group. As I said above, get a little bag of baby potatoes (I used a 24oz bag of Yukon Golds which yielded about 16 potatoes) and boil them until fork tender – about 25 minutes. Want to use your Instant Pot? No problem. Add the trivet and a cup of water, then your potatoes. I’d go MANUAL for about 5-7 minutes. Then we simply drain the potatoes and let them sit for about 5 minutes to cool. Carefully take a potato and using whatever smasher you can find – gently smash the potato until it’s flattened. 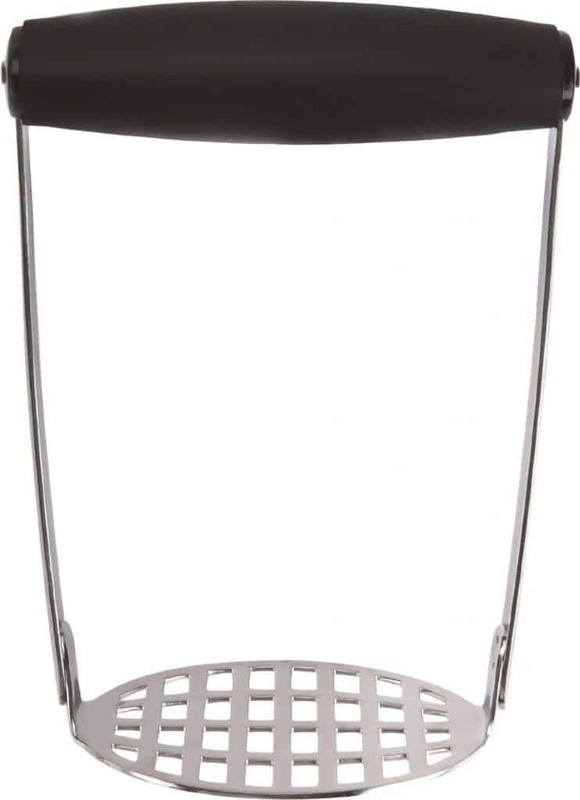 I used this kind of potato smasher. I tried the old fashioned kind and it wanted to mash my potatoes, not smash them, so I reverted back to the round type. I’ll post a pic and link here to my Amazon Store so you can see what I’m talking about. (Note: Affiliate link – I’ll make a few pennies if you buy one). 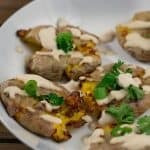 Then we simply place our flattened potatoes on a parchment-lined cookie sheet and bake in a 350-degree oven until the outside edges get crispy – about 30-40 minutes. OR – place them in your air-fryer at 325 degrees F for about 15-20 minutes. Add all the ingredients in the recipe section below to your blender and blend away until super creamy and smooth. You will have to stop and scrape down the sides a few times, but take your time and it will eventually get smooth. Soak the cashews for at least 1-2 hrs before – it helps then get creamier. Adjust the amount of garlic to your own personal taste. I used 3 large cloves – but I love garlic. Rinse and drain the beans, but save some of the bean liquid (aquafaba) just in case you need to thin down the sauce a little. The recipe will make more than enough Aioli. You can store it covered in your fridge for about 7 days. Use the extra as a mayo replacement, or dip, or maybe even a dressing. That’s it! I’m anxious to hear what you think so please, leave those comments! And until next week – Keep on Cookin’! These sound amazing! 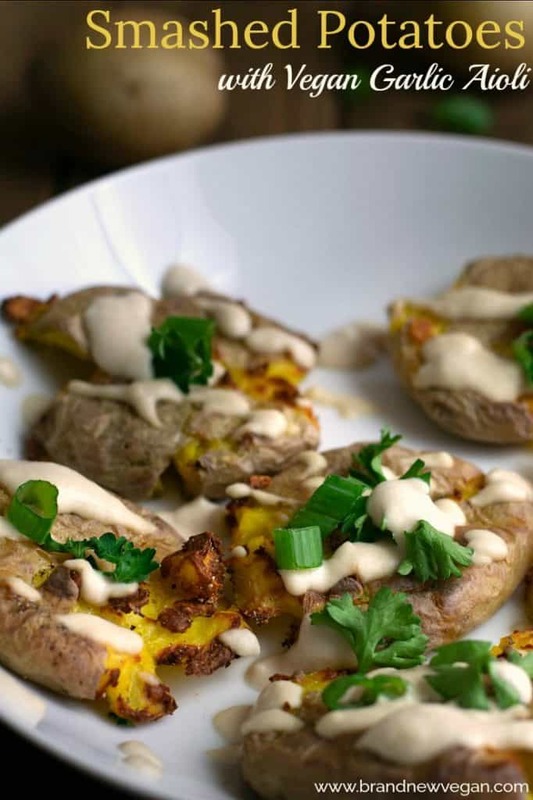 Smashed potatoes are such a good idea. My husband now wants smashed sweet potatoes, not sure how we’d go about that! just do the same thing with small sweet potatoes. Trader Joe’s and other grocers sell baby (small) sweet potatoes. I just scrub mine, prick and toss into the microwave to cook before smashing. In the recipe you call for a can of whitecbeans. Is that garbanzo beans? No, if you watch the video I show you the can of beans I used. It simply says White Beans. Thanks for the recipe. Smashed potatoes are really good love the Aioli sauce. I will be using that a lot in place of mayo and on broccoli etc. I cook Brussel Sprouts this way! Boil, Smash then Roast till crisp! I season them with lots of paprika, pepper and garlic! We made this last and it was so easy and so good. Loved the garlic aioli! Its such a good sauce to top on lots of different things. Everyone was surprised one of the ingredients is beans. I added less cashews, more beans and used it as a pasta sauce, so delicious, love the garlic flavor. But it was so tasty I didn’t care… and looking forward to the leftovers that I have!!!! I went to make this tonight and realized I didn’t have white beans! It was delicious without them! I haven’t made this yet, but did get the cannelloni beans. After my initial trial, I want to try it with roasted poblano peppers. This sauce has so much potential, thanks Chuck for another winner! Would this be good without nutritional yeast? Totally scrumptious! Simple and straight forward.to make. If you soak the cashews overnight , they blend far better. If that’s not an option and one has a nutribullet, it really does a number on those nuts. I’ve made a cashew based Caesar dressing this way and the consistency is super creamy. Made these today super yummy and the sauce – brilliant!! I make cashew sauce a lot but of course it’s high in fat. This alternative is beyond delicious, and the guests I tried it on had no clue it was dairy free OR had beans in it! What a great way to cook potatoes! Took our first pass at this recipe, feel we could have a) cooked the potatoes a tad longer for greater crispness, and b) measured our freshly cooked beans better. Hey, it makes a fine hummus, too! Anyway, tasty, and we’ll get it right next time! These are great. I cooked the potatoes in the Instant Pot and then baked them. The texture is fantastic, creamy inside. The sauce is also very tasty. Thank you! I just discovered that the sauce is also fantastic on artichokes as well and as a salad dressing! I’ve never soaked cashews. How much water & do I blend the water too or drain? Thank you! I’ve tried your cauliflower taco meat & goulash! Amazing recipes! When I make smashed potatoes I use the bottom of a pint glass. Works great!